← Can fashion keep you from finding true love? 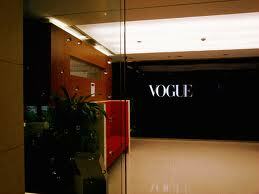 Some people go to Church....others read Vogue. Breakfast at Tiffany’s. When I was around 6 or maybe 7, my dad had a heart attack while he sat across from me at the kitchen table. Luckily, my Uncle Murray was there and took him to the hospital along with my mom. For some unknown reason, my house was not in fact full of a 100 people and I snuck into the den perhaps in part to escape the afternoon’s tragic turn of events and turned the television on. I entered a world called Breakfast at Tiffany’s and in no small way I very likely have never come back from that fabulous place discovered on that eerily quiet afternoon. Vogue. I bought my first Vogue at around this same time, and have devoured approximately 45,000 fashion shoots in New York and know full well that Paris may be where the couture is, but the Queen of Fashion, Anna Wintour, lives in New York as well as her creative genius, Tonne Goodman. Both are up in those Vogue offices dreaming of the next issue and I’ll be thrilled to be in their storied world however briefly. Art. Lots of art. Street art. Ancient art. Fashion art. Dance arts. Theatre arts. Architecture. Some of the greatest art in the world. Humbled and joyous will be a mix of what I’ll feel I’m sure. Central Park. How can you go through life never having kissed in Central Park? The Plaza. C’mon, do I need to explain this one? I grew up in a crib that was then made to resemble a bed, with ice on the inside of my bedroom windows, and linoleum floors so ugly my toes curled up in disgust. I will love, love, love New York and fingers crossed I even have the wherewithal to leave the promised land after I arrive. I am so excited for your upcoming trip to New York! I say boo and hiss to those who say you may be disappointed. Maybe it will be exactly what you imagined and maybe it will be something different. My guess is it will be something in between and fabulous! You can’t have cocktails with Carrie – but you can write a column for your blog while wearing something fabulous in one of those cool cafes in the Village – and maybe Audrey Hepburn won’t be there either but it doesn’t mean you can’t stare in the window of Tiffany’s wearing a little black dress!! I think your fortune-tellers can’t see that you aren’t seeking to re-create the experiences of these characters – but have been inspired by them as a basis for creating your own! I am looking forward to blogs about Margaret’s New York! Which I know will be an inspiration for my own New York!! But I have to tell you that I “may be (a little) disappointed” myself if you don’t experience the food from street cart to Plaza room service!! And Karma, I wasn’t disappointed, you had it right! !